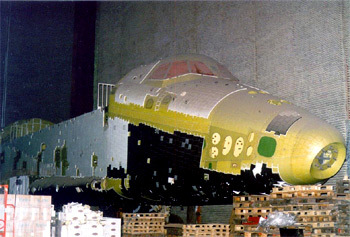 Model 2.01 was the third shuttle in construction when the project was stopped in 1993. This model is the first of the second generation, these Burans had undergoes some modifications and improvements in comparison to the 1.01 model. The principal improvements were made on the cockpit. The completion of model 2.01 at the stop of the project was estimated to 30-50%. As you can see on the photographs it seems that it has been dismantled, after few years in the Tushino factory, near Moscow, it was moved in October 2004 on a car-park. News of OK-2.01 on the blog.